I gave a talk this morning at the iblog2 conference here in Manila, giving my spiel: Global Voices, international blogging, and the need to build more bridges. This is the second annual blogger conference in the Philippines, which has developed a lively and politically influential blogosphere. Afterwards I heard a presentation by lawyer Manuel Quezon about political blogging in the Philippines. He describes several categories of Philippine political blogs which I think are useful for any political blogosphere: "propaganda blogs" (pushing a political agenda/party/candidate), "bully pulpit blogs" (the political op-ed page), "intellectual sandbox blogs" (where the policy wonks analyze what's going on), and "witness blogs" (first-hand accounts of events that take place). There are also different political roles the blog-reader plays: observer, explainer, proposer, exposer, and attacker/defender. The blogger and visitor can engage most constructively if they work out who is playing what role. We also heard from Peter Lavina, a blogging councilman from Davao. He believes that his blog has enabled him to be in better communication with his constituents. Several bloggers raised the problem, however, that most Philippine bloggers are writing in English, not the national language, Tagalog. 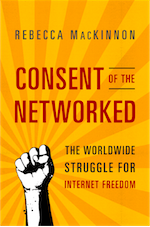 The blogosphere as an elite conversation is a concern here, as it is in many countries. It was also pointed out that the majority of bloggers here are from one side of the political spectrum. I also heard a presentation by Emil Avancena, founder of the Philippine blog hosting service DotPH. He and a colleague introduced a cool new Web 2.0 service they've developed here in the Philippines called Calliope, which consolidates all of your content from various Web 2.0 services: your blog, your flickr account, your del.icio.us bookmarks, your YouTube videos, and so on. Looks like something I could use. All around Asia, local companies are starting to build innovative new social media services and tools to suit the needs of local users. I hope the ideas and innovations that emerge here will get spread around the globe. Hi Rebecca. I'm not a lawyer, I'm a journalist. It was a pleasure meeting you and hearing your keynote address. 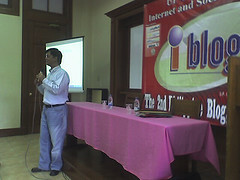 Thank you so much for supporting iBlog2 and hope you'll visit the Philippines again next year. Tagalog is a beautiful and romantic language, but unfortunately has a limited vocabulary. Foreigners who learn the language speak it better than most Filipinos. Filipinos speak Tagalog colloquially, whereas foreigners speak it eloquently in its formal and literary form. Tagalog is the language of the capital and is one of the eight major languages in the country (there are between 100 to 150 indigenous languages and dialects in the Philippines). But Tagalog is not the language spoken by the majority of Filipinos; only 23% of the population are native Tagalog speakers. The Tagalogs are a part of the population, and the language, culture, and customs of this segment do not speak for the entire nation. We alienate other linguistic groups by choosing this indigenous language, only because it is the language of the capital. Thank you for your inspiration. I must confess I express myself better in English than in my native languages like Tagalog and Cebuano. But almost all Filipinos understand English. Our problem is connectivity. There are still many areas that have no internet service. But the large overseas Filipino communities all over the world where internet is available are our market too. Best wishes.